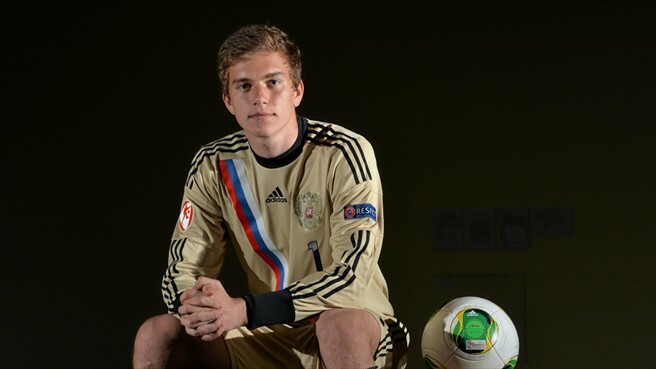 Spartak Moscow’s 19 year old goalkeeper Anton Mitryushkin is one of the brightest talents in Russian football today. He was the starting keeper of both the Russian U-17 squad that won the European Championship in 2013, and the Russian U-19 squad that just finished second in this year’s U-19 European Championship that took place in Greece. At the U-17 championship two years ago Mitryushkin was a key reason for his country’s victory and he was awarded the Golden Player Award as the most valuable player of the tournament. He joins a long, and prestigious list that includes football greats such as Wayne Rooney, Miguel Veloso, Nuri Sahin, World Cup Final winning goalscorer Mario Götze, Cesc Fabregas, Bojan Krkić, and Toni Kroos. At this year’s tournament Mitryushkin was once again the decisive component for Russia’s success. Despite the fact that Russia lost to Spain in the final, UEFA.com gave the keeper a rave review, citing his stellar performance in the final, and the tournament in general. The well-known Russian sport’s journalist and Spartak specialist Igor Rabiner has pointed out that Mitryushkin’s talent was already evident at the U-17 tournament two years ago, and that the keeper has at the U-19 tournament made another significant move forward in his development. Now the most important next phase for Mitryushkin will be regular playing time in the Russian Premier League. The timing couldn’t be better for the young keeper, as Spartak’s new sporting management, coach Dmitriy Alenichev, and the sporting director Sergey Rodionov, were put in charge by Spartak owner Leonid Fedun in order to reform the club. This emphasis on reform that includes putting a greater priority on developing graduates from the club’s youth academy. Mitryushkin, when asked whether he would move abroad to gain more playing time said to Sport-Express: “I do not want to think about a possible move to Europe. The main goal for me right now is to become the number one at Spartak.” This statement suggests that Mitryushkin, for now, is willing to try his luck at Spartak, but would consider a move if the club does not grant him sufficient opportunity. It is now up to Russia’s football authorities to ensure that players from the successful U-19 squad receive the necessary resources to take the next step to the professional level. Mitryushkin, and many of his teammates, form the backbone of a young, and exciting team that could successfully represent Russia when the tournament takes place in the country in 2018. Russian Youth Football – Where Is Russia’s Next Golden Generation?